Park Bay House will delight you with stunning views and the soothing chorus of waves breaking over the offshore reef. The spacious beachfront villa sleeps up to eight people comfortably in four bedrooms. Unique among Bequia villa rentals, Park Bay House affords complete privacy, surrounded by splendid beaches and pristine woodlands, all just ten minutes from town. 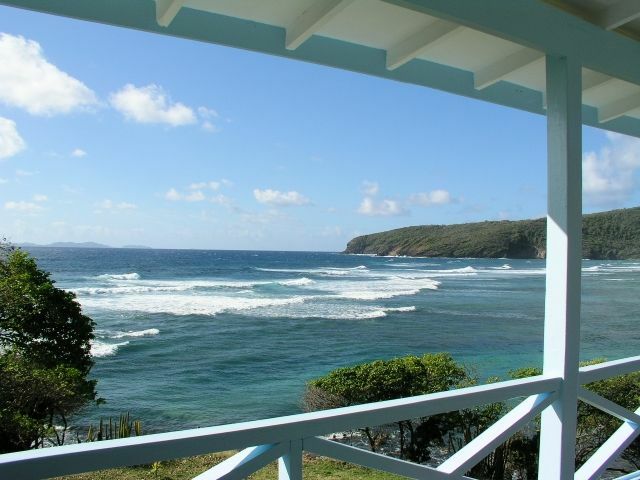 The villa offers some of the most breathtaking views on Bequia, punctuated by dramatic waves in the foreground and the neighboring Grenadine islands in the distance. Relaxing on the well-shaded porches, you feel like you're floating over the beautiful ocean, caressed by the trade winds...and at night the stars explode from the perfect darkness that surrounds you. Park Bay House is a truly special place, giving you the best that Bequia has to offer: lovely beaches, unspoiled wilderness, and the constant cooling trade winds. The house is built in traditional West Indian style from tropical hardwood and native stone. With four bedrooms and three baths, the two-story villa is perfect for both large and small groups. Eight beds and a sleeper sofa accommodate up to eight people comfortably, while two living rooms, two expansive porches, and a large courtyard ensure plenty of space and privacy. Each of the villa's bedrooms has a distinctive character, and all the beds are fitted with high-quality mattresses and fine linens to provide luxurious comfort. Upstairs is a master bedroom with an antique four-poster king bed and a second bedroom with twin beds. Downstairs are two more bedrooms, one with a queen bed and a twin-size day bed, and one with two twin beds that can be joined to form a king-width bed. All the rooms have fabulous views. The living rooms and master bedrooms offer spectacular views of the sea, with the neighboring Grenadine islands on the horizon. The rear bedrooms look out at the lovely rising hills, accompanied by soft wind rustling through the trees. Everywhere in the house is peaceful, serene, and private. Both floors have a large living room filled with comfortable furniture, opening onto well-shaded porches where lounge chairs invite you to soak up the view. The upstairs porch wraps around the side of the house, where you can sunbathe during the day and stargaze at night under delightfully dark skies. To the rear of the house lies a stone courtyard that's a perfect location for outdoor eating, playing, and relaxing. Or you can just sway in the hammock in the shade of the trees and doze to the gentle sounds of the surf. Park Bay House is surrounded by miles of stunning coastline and hundreds of acres of untouched forest. At your doorstep is beautiful Park Bay, whose shallow water and protective reef make it ideal for wading and swimming. From the property you can step over the narrow rocky shoreline and dive into the bay's crystal-clear warm water, where you can swim, snorkel, or just wade around. The bay has patches of sandy bottom where you can comfortably bob around in the gentle waves, and the chest-deep water makes for safe swimming for adults. The sandy beach at the foot of the driveway has calm tide pools perfect for young children, formed by a rocky reef just offshore that blocks the waves. When the kids are done swimming they can visit the Turtle Sanctuary at the far end of the bay, where sea turtles are raised for safe release. A few minutes' walk takes you to stunning Industry Bay, a palm-fringed crescent of sandy beach and calm water, with one of the best restaurants on the island. In the other direction, right out the villa's back door are hundreds of acres of unspoiled woodland, with paths leading to deserted coves and dramatic headlands. And all the rest of lovely Bequia is within easy reach. Satellite internet is good for email, general browsing, etc., but it has a per-day limit that makes it unsuitable for streaming or big downloads. A large antique dining table can seat up to 8 people. Weekly housekeeping. Free airport/ferry pick-up and drop-off. It has been two weeks since we left Park Bay House, and the entire family is ready to book again. The house is a little rustic and secluded with beautiful ocean views of Mustique and a constant ocean breeze. It was plenty spacious to accommodate the seven of us and had all the basics for a great Caribbean vacation. The few negatives were that the adjacent Park Bay Beach is not amenable for swimming and the strong winds prevented us from dining on the patio and using the gas grill (which seemed very under powered). Nevertheless, we thoroughly enjoyed the beaches on Admiralty Bay, a short drive from Park Bay. We dined at several restaurants as well as cooked our own meals, some with locally caught fish. The entire island was enchanting. We particularly enjoyed our walks back after a delicious dinner and dessert at nearby Sugar Reef. The full moon above the swaying palms was magical. We also had a fun, relatively easy hike from the hill behind the house to Bequia Head, with great views of St. Vincent in the distance. We definitely would return to Park Bay House. Thanks for your great feedback, we're glad you had such an enjoyable stay! We will make sure the gas grill is thoroughly checked out, and we've added more detail to the description of the bay and beach based on your input. Thanks again and hope to see you back soon! Lovely getaway beach house. Wonderful concierge service and pleasant caretaker. House is very accommodating for large families . All in all we had a lovely stay . Thank you for your feedback Iva-Lisa. I'm sorry you had problems with the internet. Like a lot of connections it is rate-limited, and I can see from the usage report that after several hours of very large downloads in the mornings (probably the kids streaming video) it triggered the rate limits, which really slow it down. I'm sorry you weren't aware of this, I've updated our info so future guests know that it's great for email, browsing, etc. but not for large downloads or prolonged streaming. You're right that the solar power works very well but that large loads like irons and hair dryers need to be used with care at night. We always have a propane barbecue grill available. We are currently in the process of replacing the patio furniture. We had an amazing stay at Park Bay House. Having stayed at houses overlooking the water at several different Caribbean islands we were looking for something different and we definitely found it at Park Bay. The house is as advertised, maybe better. It's as close to the water as the pictures indicate, with unbelievable views and the constant sounds of the waves giving it a unique advantage over most properties. We found that "being off the grid" wasn't a bad thing. The ocean breezes blowing trough the house and across the deck kept us comfortable night and day and bugs were not a problem. I was even able to see some great stuff snorkeling right off the property, including lobsters, an eel, octopus, flounder, and a giant crab. The owners were great when responding to any questions or issues we had, always getting back to us in a prompt and friendly manner. The staff was very accommodating as well. The welcome dinner, ride to the house from the ferry dock, help with a rental car, and daily housekeeping service all helped to make the long trip there worth it. The house is only a few minutes from town but it feels like your the only one on the island. Even though Bequia has several good restaurants and beaches we were reluctant to leave the house. I would recommend Park Bay house to anyone looking for a memorable stay at a beautiful Caribbean island. We had a great time at Park Bay house. It is exactly as it appears in the pics. The staff was great and the location was awesome. It is a few minutes from town which makes it super peaceful. But still very easy to get into town. A car was helpful, though you could walk. The sound of the waves and the ocean breeze were perfect. The breeze kept the bugs way for the most part. You can snorkel from the house and there was lots of hiking. We would go back again. My wife and I rented the Park Bay House for two weeks in March 2009. The weather was perfect with only occasional brief showers from time to time. It has a fantastic location over a deserted beach. You can see the sea from most rooms and hear the surf. It is near the end of the road so very quiet but still only maybe ten minutes from town by car. You probably will need a rental car unless you can plan shopping trips very carefully and take taxis. It has a nice "cozy cottage" feel and is very tastefully decorated. The main living room, dining room, kitchen area is one large room with folding doors that open onto the porch so you feel almost like you are living outside. We were worried about mosquitoes because the house was so open but we only saw a few and they seemed half dead. There was a steady breeze flowing through the house day and night so that probably helped. Could be more of an issue in the rainy season. It is "off the grid" so is solar powered for electricity and hot water and that worked very well, surprisingly. The wireless Internet also worked well so I was able to keep in touch and do some work on my laptop computer. The housekeeper and handyman were great, as were the staff at Grenadine Island Villas who managed the house and answered our many questions about the island. There is a surprising variety of restaurants and small food stores for such a small island, probably because sailing yachts provision there. The harbor in town was always full of sailboats. Getting to Bequia is not easy - took us two days each way from the East Coast because of limited flights but once there, we had a fine time. All in all, it was a great vacation.